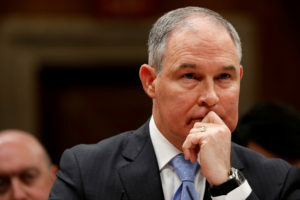 WASHINGTON (AP) — On a trip to Morocco last year, Environmental Protection Agency Administrator Scott Pruitt and his staff missed a connecting flight and spent more than 24 hours in Paris because his security detail’s weapons and other gear couldn’t be transferred between the planes in time, his former security chief told congressional staffers last week. That’s according to aides to the House oversight committee, which is investigating Pruitt’s pricey taxpayer-funded travel, including the use of premium seats by the embattled administrator and his security chief. Pasquale “Nino” Perrotta’s early retirement from EPA was announced shortly before he met with oversight committee staff. The aides spoke on condition of anonymity because they were not authorized to publicly discuss Perrotta’s closed-door interview. Perrotta’s account differed from EPA’s official explanation for Pruitt’s lengthy Paris layover in December, which the agency had blamed on poor weather. While it is true that Pruitt’s departure from Washington was delayed by snow, a review of flight records by The Associated Press shows he could have made a connecting flight and a reserved a back-up flight to Morocco if not for the complications over his security team’s guns and gear. After months of news reports and announcements of investigations on alleged ethical lapses, White House sources signal that President Donald Trump’s support for his environmental chief appears to be wavering. Trump’s enthusiasm for Pruitt has cooled, according to three West Wing aides and outside advisers who spoke Tuesday on the condition of anonymity to discuss internal conversations. Trump grumbled to aides that he was getting tired of the ongoing distraction, according to the advisers. He took particular exception to the report that EPA staff had tried to plant a negative story about Interior Secretary Ryan Zinke to take the heat off Pruitt. EPA has denied the allegation. White House officials have begun making the case to Trump that Pruitt’s deputy, former coal lobbyist Andrew Wheeler, would be a strong replacement and continue Trump’s business-friendly agenda to roll back environmental regulations. Members of the House oversight committee and other lawmakers are looking into the costs and justification for the Paris and Morocco trip, arranged with the help of a lobbyist and dealing in part on potential natural gas deals between the U.S. and Morocco. EPA’s inspector general is also conducting separate investigations into Pruitt’s travel, security spending and other issues. Perrotta was the first of five current and former EPA staffers set to be interviewed by the committee as questions about Pruitt’s outsized security and travel spending put Pruitt’s job in jeopardy. After months of news reports and announcements of investigations on alleged ethical lapses, White House sources signal that President Donald Trump’s support for his environmental chief appears to be wavering. But when congressional investigators asked Perrotta to detail those threats last week, he was unable to provide specifics. EPA officials have previously cited an incident last spring where a fellow traveler in an airport used an expletive in telling Pruitt to quit messing up the environment. Soon after arriving at EPA, Pruitt began receiving 24-hour-a-day armed security, a level of protection not used by past administrators. The Associated Press reported last month that providing round-the-clock coverage ballooned overtime costs and required expanding Pruitt’s personal security detail to include 20 agents, costing nearly $3 million in his first year. Pruitt has traveled extensively since his confirmation as EPA administration, including an earlier trip to Italy. EPA officials have declined to release the total travel costs for Pruitt’s staff and security team. For the Morocco trip, records show Pruitt’s premium-class airline ticket cost taxpayers $16,164. Pruitt was ticketed to fly Dec. 10 to Rabat, Morocco, through Paris. While snowstorms in the United States delayed Pruitt’s flight from Washington to Charles de Gaulle by two hours, it took off that same evening, although under a new flight number in part because of the time. In addition to his reservation for the connecting flight to Rabat, he had a backup one from Paris to Casablanca five hours later. The committee aides who spoke to the AP said Pruitt’s security staff was traveling with weapons and other gear that were being transported in the cargo hold of the plane and that they didn’t have time to transfer the equipment to the connecting flight to Rabat. Perrotta said they couldn’t use the back-up reservation to Casablanca because Moroccan authorities had approved the weapons and other security gear only through Rabat, and that necessitated the layover, according to the aides. Kevin Chmielewki, former deputy chief of staff for Pruitt, said the gear Pruitt’s security team traveled with typically included firearms, protective vests and radios. EPA spokesman Jahan Wilcox has given this account for Pruitt’s Paris layover. “Due to snow at Washington Dulles, Administrator Pruitt’s outbound flight was canceled, he missed his connection at Charles de Gaulle Airport and took the first available flight to Morocco, which was not until the next day,” Wilcox said last week. He declined again Tuesday to give further details of the missed connections. In Paris, Pruitt and his staff stayed at a five-star Sofitel hotel near the Arc de Triomphe. His hotel cost for the night was $494, including the unused room in Rabat. The layover left the EPA contingent with only one full day on the ground in Morocco. An EPA news release of the trip shows photos of Pruitt talking or shaking hands with government officials for justice, mining and energy. But there was no indication whether a scheduled meeting with Morocco’s prime minister ever occurred.